The island of New Guinea has one the richest and most varied avifauna in the world. The 708 bird species identified so far for the islands include 578 land and freshwater species, 40 sea birds and 90 migrants from countries to the North and South. 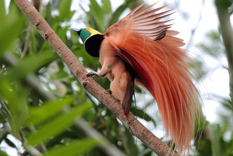 Of course, the greatest sighting is of the illusive bird of paradise. Arrive in Port Moresby. Overnight Airways Hotel . Known for its spacious design and open air restaurant with views across the airport. Amenities include: restaurants, cafes, bar, boutiques, outdoor pool, fitness centre with lap pool and spa. Fly with Air Niugini to Tari. Half Day Tour. Overnight Ambua Lodge. estled amongst the Doma Peaks near Tari, almost 7000 feet above sea level, is Ambua Lodge. An award-winning, eco-friendly lodge boasting magnificent views of the Tari Valley below. Full Day Tour. Overnight Ambua Lodge. mbua arranges culturally based excursions to nearby Huli villages where one learns about and observes everyday life of the Huli's, as well as the peculiarities of their traditions and beliefs. Guests tour in comfortable Toyota Hiace and Coaster buses and are accompanied at all times by experienced and knowledgeable Huli guides from the local area, so as to make the experience all the more educational and rewarding. Full Day Tour. Overnight Ambua Lodge. A favored destination amongst birders, Ambua's rain forests have been the star of many a wildlife documentary. An incredible 217 species have been recorded here and Ambua is home to 13 different species of Bird of Paradise. Ambua employs knowledgeable local birding guides and caters for all interest levels, from early morning birding excursions for guests on more culturally orientated tours, keen to catch a glimpse of these spectacular birds; to fully specialized birding tours tailored to the seasoned enthusiast. Charter flight to Lake Murray. Afternoon Tour. Overnight Lake Murray Lodge. Lake Murray Lodge arranges excursions around the lake in 8-seat river boats to visit local villages, birding sites and fishing spots. Western province is home to over 50% of New Guineas total bird population. Lake Murray is one of the best bird watching areas in the Province. In addition to a host of migratory , several birds of paradise species, pelicans, hornbills, eagles, parrots and numerous other birds have been sighted. Full Day Tour. Overnight Lake Murray Lodge. Island communities of stilted houses dot the water landscape of the lake. Dugout canoes are the primary mode of transportation and fishing is a major source of food to the local population. Full Day Tour. Overnight Lake Murray Lodge. Lake Murray is the largest lake in Papua New Guinea. During the wet season it spreads to occupy an area of about 2000 square kilometers. It has a population of about 5,000 people scattered in small villages, both on tiny islands and coastal areas of the lake. Full Day Tour. Overnight Lake Murray Lodge. Guests are accommodated in 12 individual cabin rooms overlooking the lake. They are furnished with king twin or double beds, ceiling fans, modern en-suite bathrooms, an elevated veranda and wonderful view of the lake. Charter flight to Mount Hagen. Afternoon Tour. Overnight Rondon Ridge. 7100 feet above sea level, on the outer fringes of the Kubor Range, lies Rondon Ridge. Boasting panoramic views of the Wahgi Valley below, Rondon Ridge is the pinnacle of luxury in a remote and rural setting. It is a spectacular introduction to our lodges on arrival and a welcome stepping stone to civilization before departure from Mount Hagen. Full Day Tour. Overnight Rondon Ridge. Over 180 species of birds have been recorded in the rainforests around Rondon Ridge including ten species of Bird of Paradise. The surrounding area is pristine rainforest and home to numerous orchid species.First contact with the Melpa was made in the mid-1930s when the Leahy brothers were prospecting for gold. 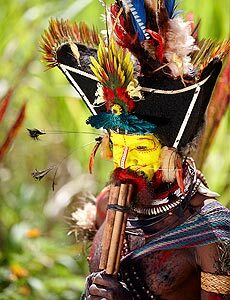 The Melpa are said by anthropologists, to be 'predisposed to capitalism' because of their complex traditional society in which 'big men' earn status by accruing wealth and then giving it all away in a ceremonial exchange called "Moka". The Lodge has a variety of new touring vehicles and all excursions are accompanied by experienced local guides from the area. Fly with Air Niuigini to Port Moresby. Connect to international flight out. 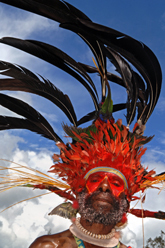 You are only to book and ticket the domestic Air Niugini flights together with your international flights. We will book the Air Charter flights.